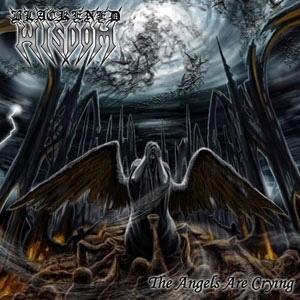 Formed in Omaha, Nebraska in 1992, BLACKENED WISDOM existed within a grey area between the worlds of Black and Death Metal, a place which was largely uncharted territory at this time. Recording three songs in 1993 with the intent of releasing a 7-inch EP, the band ceased to exist shortly after this session and the tracks fell into limbo... Lying dormant and unreleased for nearly two decades, "The Angels Are Crying" will finally reveal itself to this world as it was originally conceived, as 7" vinyl. BLACKENED WISDOM explored the unknown and the forgotten, traversing a spectral realm of storms and anguish. "The Angels Are Crying" is a sonic gateway to this turbulent place where angels fear to tread. Cover art by master graver Jon Zig conjurs the vision of this chaos with haunting clarity.